Today, in Australia, we are celebrating Father’s Day! I cannot let the day go by without paying tribute to my own fabulous father. He is the most caring, compassionate and giving person I have ever had the pleasure of knowing. He’s funny (although sometimes those Dad jokes are a little extra lame! ), supportive and generous and I am completely blessed to have him as my Dad. Here’s the card I made for him. I’m in a phase where things just aren’t working like I have them in my head. It’s getting a little frustrating. Fortunately, my Dad likes everything I make (although he did make me move the dog lower, which is why the shading is a bit odd. haha). Materials used: Stamps – F-1250,G-1245, K-1239 (Art Impressions); WF51 (Stamp of Approval); Distress Ink; Distress Markers; Designer Paper – 6×6 Paper Pad – Max & Whiskers (Basic Grey); and Ribbon (American Crafts). I think I might also enter this card into the current Art Impressions challenge. It is Challenge 117 – People Parade. I have a few stamps from Art Impressions and they are so fun to play with! Thanks for visiting today! Hope you have an amazing day! Belated Happy Father’s Day to your Dad, Kylie! 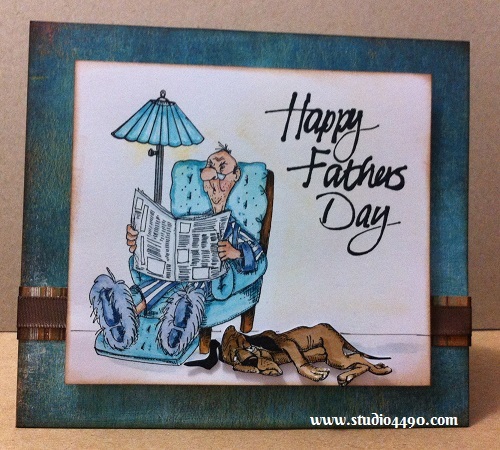 He must be thrilled to have such a talented daughter making such delightful cards for him! This one is awesome; once again your fabulous colouring breathes such ‘life’ into these images. I want a pair of those fuzzy slippers to wear when the cool fall nights start to get even cooler (which is way, way too soon!). So glad that you’ve entered into the AI challenge! I’m with Bev: winner, winner, winner!! Have an excellent day, Kylie!! I’m heading home later (sad face), but with work tomorrow, I’ll have things to do to lessen (a teensy bit) missing my family. Your card is a cheer-up today; looking forward to more soon! Oh my Kylie!!! I am so glad you stopped by my blog and left such a kind comment…I am tickled to have found your wonderful blog! Your creations are simply amazing!! !